With a vase life of 7-10 days and a wealth of symbolism including a mother’s love, a carnation floral arrangement is designed for someone special. 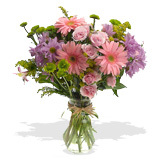 Cheerful carnation floral arrangements are an inspirational gift. Giving someone a carnation floral arrangement is a stylish way of expressing your love and admiration for this person. Floral arrangements really do speak a thousand words. ABOUT CARNATION FLOWERS: The carnation flower, also referred to as Carn or Chinese Pink are available all year round. Carnations symbolize many things depending on the color of the carnation flower. Pink carnations are said to have first appeared on Earth when a tear fell from the Virgin Mary's eye when Jesus Christ was carrying the cross. According to Christian legend, the carnation flower was said to have sprung up from the Earth when her tear hit the ground, therefore the pink carnation represents a Mother's undying love. CARNATION ARRANGEMENT CARE INSTRUCTIONS: Your carnation flower topiary arrangement has traveled a long and hard journey to get to you so make sure you remove the floral arrangement from the box immediately and hydrate the carnation flowers with some fresh water. You carnation floral arrangement comes prearranged in floral foam and needs to be watered daily to ensure that the floral foam stays moist at all times, as flowers find it harder to take in water when inserted in foam as opposed to when arranged in a vase. We advise that you mix the floral food in a container with luke warm water and feed your floral arrangement with the floral food solution daily. Also remove the wooden floral sticks inserted in the four corners of the container, inserted to support your floral arrangement during travel. Some flowers may get displaced during travel, just reinsert the broken flowers back in the foam.